Versions: Recorded with Access 2013. Also use with 2007 and 2010. 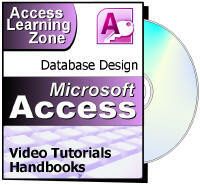 Access 2003 users should get Access 308 for the lessons on importing, and Access 313 for the lessons on splitting your database. Pre-Requisites: Access Expert Level 20 strongly recommended. This is NOT a class on Windows networking, so we will assume you have a Windows network already set up, and you know how to create user accounts and a shared folder at the Windows level. We will briefly go over creating shared folders, but we're not spending a lot of time on it. Today we will begin by learning how to import database objects from other Access databases. 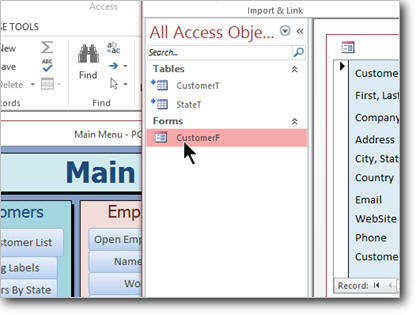 We'll import tables, queries, forms, reports, table relationships, menus, toolbars, import/export specs, and more. Then we'll learn how to Link to other Access databases to share data in real time. We'll learn how to create custom front-end forms for specific purposes. Next we'll study multi-user database theory. It's always good to learn about how things work before starting to get your hands dirty, so we'll learn about sharing your database, why you want to split your database into front-end and back-end files, and the pros and cons of a multi-user database. Next we'll learn how to actually split our database. We'll learn about opening a database for exclusive use, the Database Splitter Wizard, the Linked Table Manager, renaming or moving a back-end file, setting up a shared folder, folder permissions, selecting users or groups, UNC path names, mapping a drive letter, and more. Now that our database is split, we'll see how to move sensitive tables (such as credit history) to a different back-end file. This file can now be protected in a different network share for extra security. 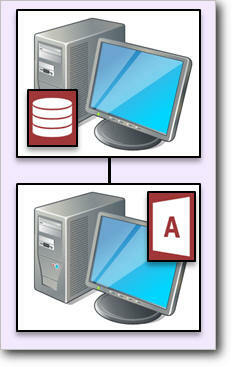 We will also create a separate custom front-end database file for different purposes. For example, your secretary might only need to see customer information. Your stock people might only need order information. Accounting needs order history and sales data. By splitting your database up you can create custom database files to fill specific roles, and not give people information they don't need access to. We'll learn how to create an encrypted front-end database file (ACCDE) so your end users can't make design changes. Finally, sharing a database on a network, in a multi-user environement can sometimes cause problems. We'll learn how to properly set up record-level locking so that two users can't edit a record at the same time. We'll learn about the Access record-lock file (LACCDB) and what it does. We'll see how to unlock a record that might be "stuck" if a user didn't shut down his database properly. This is the 21st class in the Access Expert series. If you want to learn how to set up your database to be shared on a network by multiple users, this class is an absolute MUST. Of course, if you have any questions about whether or not this class is for you, please contact me. What is an LACCDB file?